Welcome back to QUILTsocial as we continue our sewing work on the Autumn Harmony wall quilt. We’ve created all the elements for the quilt — four branches, eight leaves and 19 berries. Now it’s time to put it all together. This quilt began life as a doodle on a scrap of paper. I find it easier to draw on a small scale. I enlarged the doodle on a photocopier until it was almost to scale and then I colored with pencil crayons. I used this drawing to guide my layout. You can use my layout or use one that is more pleasing to you. Unique fabric glue stick and several well-placed pins will ensure the bias branches curve properly. Start by adding the bias branches. These can be encouraged to bend because they’re cut on the bias. Use Unique fabric glue stick to temporarily position the branches into a curve. I turned the raw edges under and use a glue stick to secure this tiny hem. Pin the branches into place. Once they’re in place, pin the leaves and the berries in place. 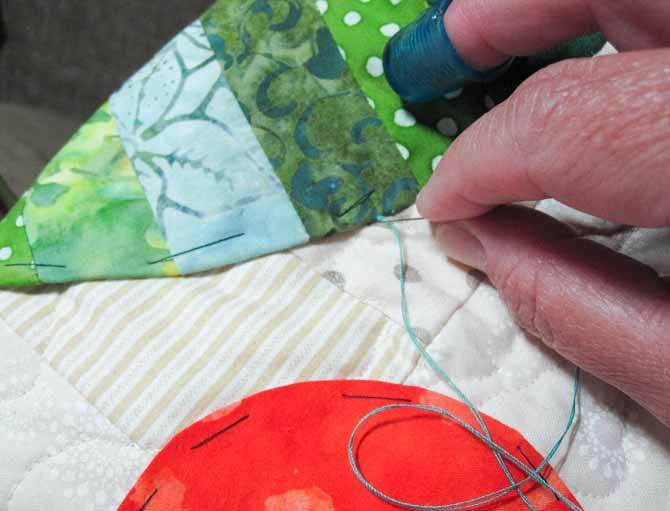 Using one strand of thread in a contrasting color, baste all the elements to the quilted base. Since the hand stitching will take several days, and much movement in and out of a quilting hoop, thread basting seemed a better option than spray basting. If you prefer to machine applique the elements, spray basting will work just fine. Stitch the appliques to the quilted base using a tiny applique stitch in co-ordinating silk thread colors. When stitching the appliques, use a tiny applique stitch and try to keep an even tension. This will help avoid puckers in the finished product. You’ll also notice that the applique stitches show on the back of the wall quilt. Don’t fret. No one will ever see them. It will be on a wall. The colors are so vibrant, who cares what’s on the back? Tomorrow, we’ll walk through finishing up our fanciful fall wall hanging. See you then. I was unaware there was such a product. I will search for the fabric glue sticks here in Canada to make my projects much easier. Hi Jenn, you should try your local Fabricland or quilt and sewing stores. I was interested to see your use of glue sticks in applique work. I have used them myself with my grand daughter when putting togetter her 1st quilt at 6 yrs old.